EAO: Your Reliable Partner for Adherence to International Standards » HHP Associates, Inc.
EAO is QM-certified for the next 3 years and has fully satisfied the requirements of the new standards, ISO 9001:2015 and ISO/TS 22163:2017, by the certification institution TÜV NORD. 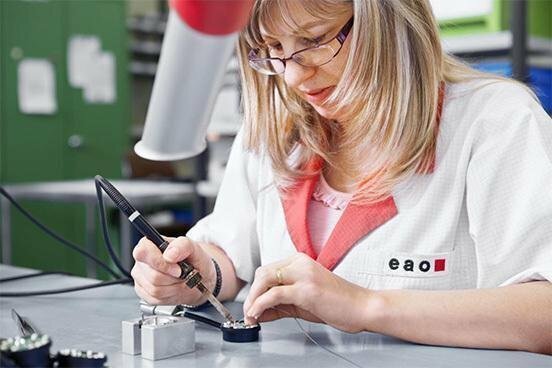 Adherence to international standards in combination with comprehensive product testing makes EAO an established and reliable partner when it comes to planning, developing and implementing your optimal HMI solutions. EAO uses in-house laboratories to subject its HMI products to various tests and assessments that replicate the most extreme condition in which the products might operate. Their products possess the key international approvals, and meet all standards and guidelines such as: CB, CCC / CQC, CE, Conflict Minerals, CSA, EAC, ENEC, German Lloyds, GOST, KBA, REACH, RoHS, SEV, TSI, ORM, UIC, UL / UR, VDE, WEEE and many more.